Ground floor: Living room/kitchen with slate floor. Snug. Dining room. Utility room. First floor: 3 bedrooms: 1 double (5ft) with en-suite bathroom and toilet, 2 twin, one with additional bunk, additional pull-out single and sloping ceiling. Second staircase to first floor: 1 twin (zip and link, can be double) bedroom with en-suite shower room and toilet. Bathroom with bath, shower cubicle and toilet. Most rooms with beams and wooden floors. Woodburner in snug (initial fuel included). Gas central heating, gas, electric, bed linen and towels included. Satellite TV. Five Freesat TVs. DVDs. iPod dock. Gas/elec range included. Combi m/wave/oven/grill. Washing machine. Tumble dryer. Dish washer. Fridge/Freezer. Wi-Fi. Enclosed, lawned front garden with patio and furniture. Small enclosed rear garden with decking. Portable Bar-be-que. Ample parking. Cycle store. Hot tub. Natural water supply from borehole. Welcome pack. Pets free of charge. No smoking. Holidays run from Friday to Friday. NB: 10 Steps, terraces and sloping banks in garden. For a better idea of where High Lowscales Farm is, you can see High Lowscales Farm on the map below. High Lowscales Farm is in Cumbria; should you be on the lookout for a special offer, you can find all the special offers in Cumbria. It's always worth checking to see what is on offer at the moment. 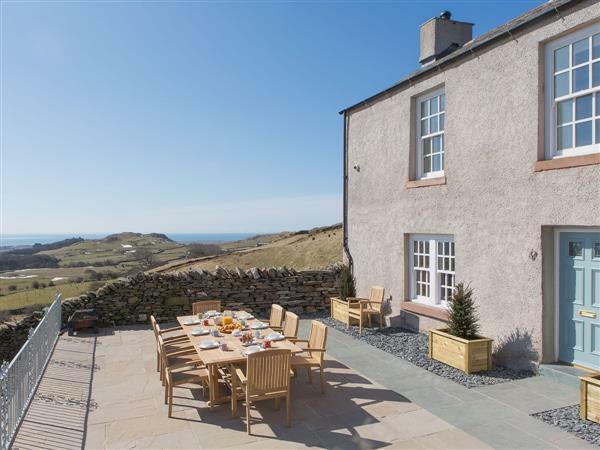 Do you want to holiday near High Lowscales Farm (28559), you can see other cottages within 25 miles of High Lowscales Farm; have a look to find your perfect holiday location.